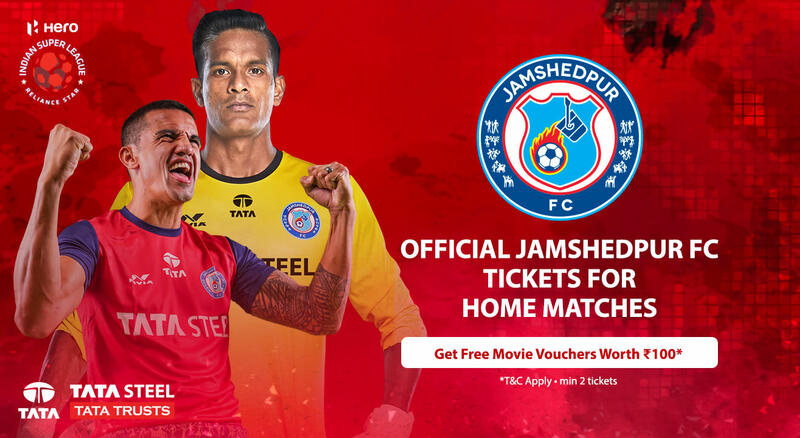 Tickets for rest of the home matches of Jamshedpur FC are out now!!! Hero Indian Super League is back after a break! Buy tickets to Jamshedpur FC’s home games here. Get a free Paytm movie voucher worth Rs.100 on purchase of 2 or more tickets. ISL Season 5 started on 29 Sep, 2018. Check out the schedule as it stands currently, here. Matches in bold are home games. Matches that are linked have tickets on Insider - click to buy. Jamshedpur FC was one of two teams to make their ISL debut in the 2017-18 season and like their counterparts Bengaluru FC, they gave a fabulous account of themselves. A 5th placed finish with more wins than losses was an admirable return for a side competing with clubs with 3 year of ISL experience. This is a side with the backing of one of India’s most ardent football behemoths in Tata, and with the right signings and mindset ahead of the new season, are liable to surprise a few of the more established sides in the tournament. Their journey is one worth following! With only a solitary loss and four wins, the men of steel sit 5th in the table, just a point off the top four qualification spots. Having ended 2018 on a high with 3 points, Jamshedpur will be keen to make the most of 2019 and secure a spot in the knockout stages. The men of steel will want to get all 9 possible points from the three remaining games at their home ground, aptly nicknamed the Furnace, and as many as possible from three remaining away games. With the quality at their disposal, it won’t be a surprise if Jamshedpur FC qualifies for the semi-finals. But can they go all the way and make history?